Goal: Replace the dingy ugly dim green LEDs w/ cool bright purple LEDs! Tools needed: See the first picture in this album! Shot of all the tools used. 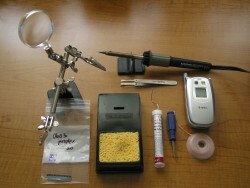 Magnifying Glass & Hand holders, the tiny LEDs are in that white bag and are the 0603 type available here, solder sponge, soldering iron, tweezers, solder, Y-shaped screw driver, copper solder remover. 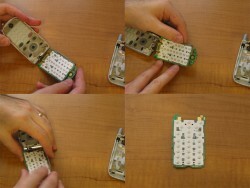 just placed pressure where the pics show, and the inner board popped right out. Each of those pink/purple dots are LEDs. You are seeing post-mod pictures of this. Those are the actual purple ones. 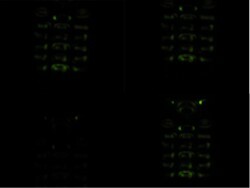 which side of your LED is negative to match it from the manufacture/supplier. It's easiest to apply a dab of solder to 1/2 of the LED, THEN position it on the LED board, heat up the dab of solder, and then align the LED. 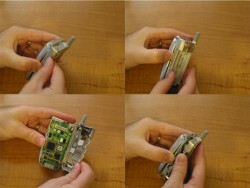 Afterward apply solder to the 2nd half of the LED. 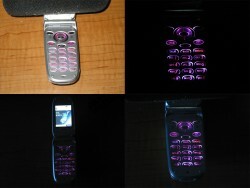 Here are some shots, although blurry, of the phone before the mod. Note how dark it is, how dingy green it is.. bleh! Here are some shots of the phone after the mod! I would have liked them to be a bit more purple, a bit less pink... But it is way cooler than the green and way brighter! 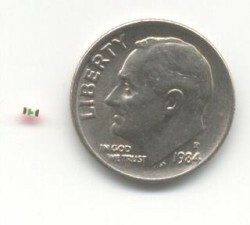 That little dot to the left of the dime: that's one of these LEDs! Really puts it in perspective. This project is not for the uncoordinated nor faint of heart. A lot can go wrong, I had to redo quite a few solders and assemble/disassemble my phone quite a few times to get it all working! You are not suposed to mix the LED's.. I.e. 3 green and 11 purple are a bad thing. I did! I did a few at a time, then checked my work. It required partial assembly/disassembly each time, but when things went wrong I knew it was one of a few LEDs, not one of 14 LEDs! !